Cuddly and Cute Octopus Lovey Blanket for Babies - Free Crochet Pattern! Home » Patterns » Cuddly and Cute Octopus Lovey Blanket for Babies – Free Crochet Pattern! Cuddly and Cute Octopus Lovey Blanket for Babies – Free Crochet Pattern! This little octopus is unbelievably adorable! If you’re on the lookout for a new and unusual crochet pattern for a lovey blanket for a young one, this just might fit the bill. The tiny octopus is cuddly and sweet and will surely provide that much needed comfort. After all that’s what makes for the perfect security blanket. It would also make a splendid baby shower gift. And if you sell your crafts for profit, this irresistible lovey just might become your next bestseller. This is a wonderful pattern and it’s free! 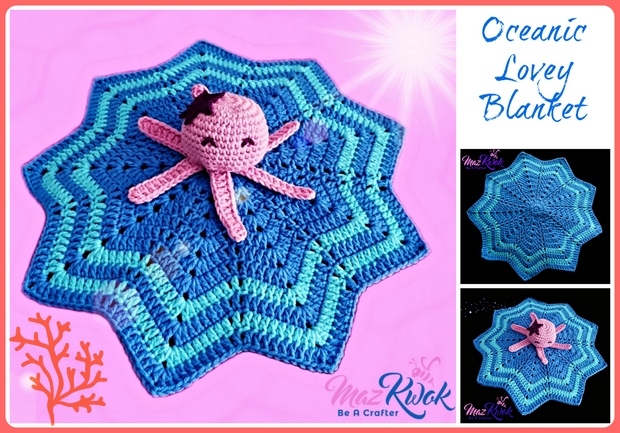 It’s the “Oceanic Lovey Blanket” and it’s by Maz Kwok of Maz Kwok Designs. You’ll find a complete written pattern that will guide you to a successful completion of this super sweet little project. And for even more free patterns and tutorials for all kinds irresistible projects for babies and some super cute -amigurumi projects — check out some of our favorites right here at Crochet Maze! Links are below!